Help us restore a historic ship in the Richmond Shipyard, the SS Red Oak Victory a 1944 Boulder Class cargo ship! We need volunteers for painting parties. 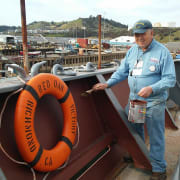 The SS Red Oak Victory needs constant attention! Metal ship plus air and moisture = rust! We need to constantly defend against the rust by chipping rust blisters, painting sealant, primer and then paint. Workdays are currently Tuesdays. We are restoring and renovating this artifact so that it will be here for many generations to come! Rescued from rust and decay from the mothball fleet in Suisun Bay the ship is a welded steel metal ship on the San Francisco Bay in contact with the elements and is constantly in need of painting. Work would be done on metal and steel throughout the ship including in the Engine Room.